Many years ago, and by "many" I mean about 20, I decided to embark on a mission to pull all the data I could and empirically prove or disprove all the economic philosophies and beliefs I held. In short I didn't want a "philosophy" or "belief" or "ideology," I wanted proof. I was sick of arguing with leftists and liberals, sick of wasting logic or common sense on pointless college-student-late-dorm-room-night debates, and all I wanted was some simple, mathematical proof I could point to and say, "There. Now have a cup of STFU." And about 20 years ago, I did precisely that. Arguably one of my best charts I ever compiled proved me correct - government spending as a percentage of GDP versus economic growth. 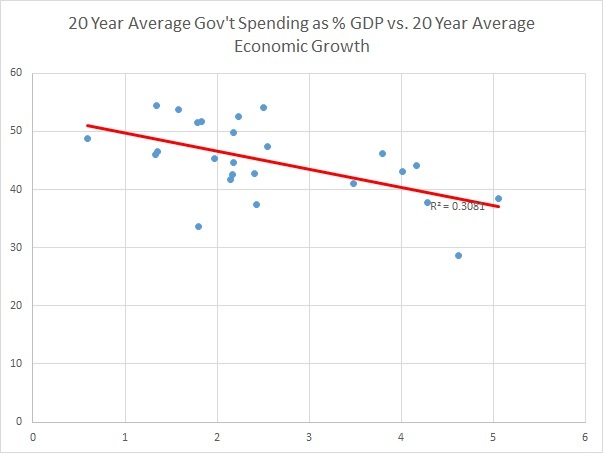 Albeit boring and now making your eyes glaze over like Ben Stein in Ferris Bueller's Day off, the chart showed a NEGATIVE correlation between government spending and economic growth with a correlation coefficient of around .3. The problem is that was 20 years ago and the data I had was not the greatest, merely what was available on the OECD at the time. So I figured it was time to pull new data and see if this relationship still held true. And boy howdy has it! Not only did the relation between government and economic growth continue to be negative, but the strength of the relationship increased to a correlation coefficient of -.55 (-.56 if you only use a decade's worth of data). Now like all economic studies there are caveats and considerations. The data above does not include Japan, Canada, New Zealand, Mexico, China or Greece. I have NO idea why the OECD doesn't have enough data on these countries to make a 20 year study, but they simply don't (though the 10 year correlation I calculated DOES include Japan). So it's merely the data I had to work with. And of course, the OECD does not include most 2nd and 3rd world nations. Only the nations who have been providing them with their economic data. Still, all these asides, if we are to look at the EMPIRICAL EVIDENCE economic growth is VERY NEGATIVELY correlated with the size of government. Even more so since you'd think SPENDING as a percentage of GDP would correlate positively with economic growth...but that is in a deluded Keynesian wet-dream world. A freer people are a more productive people. If you let people keep the majority of their wealth and fruits of their labor they will work more, create more, innovate more, and your economy will grow more. It's not only logical and empirically proven, it's simply moral. Of course, the parasites of society will whine and contest and complain otherwise, desperate to use the force of government to enslave you to support them, but it doesn't change the fact that a smaller government results in a better and ever-more progressing society. The issue is simply if society wants to vote for parasitism and dependency of excellence and independence. grey enlightenment, your analysis is incorrect. Increased government spending means higher taxes. Taxes come from profits and salaries. This means less money left behind for businesses and individuals to spend. So it therefore becomes a comparison of (businesses + individuals) spending versus government spending resulting in economic growth. Aaron has plugged actual real world values in for comparison, and the numbers demonstrate that government spending is less effective for spurring economic growth. Or, y'know, just Google "Rahn curve". It's not like you discovered anything new here, Cappie. Correlation caveats etc. However, it is interesting that a small reduction in government spending seems correlated with a large increase in year on year growth. I had always thought the effect was a bit slower. Government spending is still salaries. It all gets turned into consumable goods somehow. Sometimes there is a bridge or a highway left behind but normally government provides services which turns money into turds. Private people spend money on the most productive projects that they can, that produce the most value possible for themselves. Governments spend money on less productive projects that the private sector will not "invest" in, that produce less value. By definition, what few spending projects that government "invests" in are less productive and less valuable, and therefore lead to less growth. Government raises taxes on me, and that increase comes right out of my surplus that I save. So right there they took money that was all going to be invested in the best returning business that I am aware of, and turned a big fraction of that money into welfare checks for single mothers, or grants for art installations, or reports that no one reads, or what have you. Very little government taxation is "invested"
It seems painfully obvious that such a correlation exists. The "problem" is that the economic growth goes into the pockets of prudent people who save, not dreadlocked nitwits with liberal arts degrees! >>>>A freer people are a more productive people. If you let people keep the majority of their wealth and fruits of their labor they will work more, create more, innovate more, and your economy will grow more. grey enlightenment, are you saying that the majority (or the whole) of countries inherently or eventually lack the ability for economic growth due to the cultural/psychological/intellectual background? @Grey Enlightment - Why do you "think" that? Show some data to prove your opinion. I guess you explained it yourself with saying "I don't know". There are a lot of variables at work and trying to prove it one way or another is very difficult. There was a paper in 2010 that came to this conclusion but was best by potential flaws. IF the govt. is spending billions on defense and other programs, it's going to help private companies. As for crowding out, the govt. is not supplying the good, but only funding contractors to make the goods. For example, a fighter jet contract. The is how should the money be spent? On more welfare spending or on growth initiatives, defense, and lower taxes. What is so great about economic growth anyway? Most of it makes the country worse. "Economic growth" is an obsession of economists. Most economic growth now is simply driven by immigration and asset bubbles. Then stop bitching about there not being any jobs James or not having money or being poor or not having any cool toys. New SURE FIRE Retirement Plan for Boomers! Episode #139 of The Clarey Podcast! Audio Version of "Improve Upon the Stereo Type"